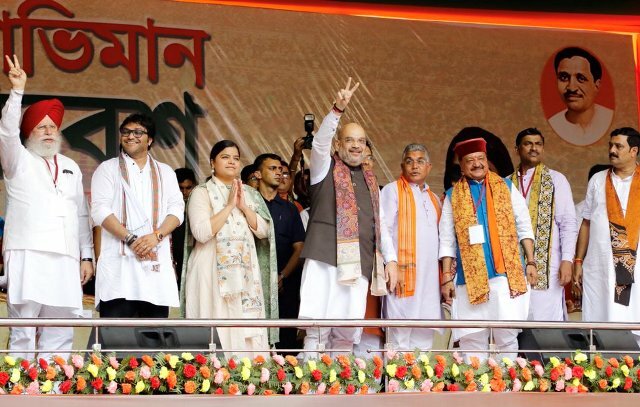 BJP President Amit Shah said on Saturday only the Bharatiya Janata Party can bring progress in Bengal as he urged the people to uproot the Mamata Banerjee-led Trinamool Congress Government from the state. Addressing a massive rally in central Kolkata’s Mayo Road, Shah came down heavily upon the West Bengal’s ruling party, accusing it of being involved in a series of corruption cases, besides destroying the law and order situation in the state. Shah said BJP is the only alternative. “Since the time the Trinamool Congress government came to power in Bengal — seven years ago, there has been series of corruption (cases) starting from the Narada scandal, Saradha and Rose valley ponzi scams… syndicates and the unlawful activities of cattle mafias and coal mafias. “In order to free Bengal from the grasp of this corruption, it is necessary to bring the Narendra Modi-led Bharatiya Janata Party in power here. “It is not just a question of ‘Paribartan’ (change) this time. I ask all of you to uproot this Trinamool Congress government and throw it away,” the BJP chief thundered. Referring to the fact that BJP is currently in power in 19 Indian states, Shah claimed the journey of his party cannot be considered complete unless it emerges victorious in West Bengal — the land of Jana Sangh founder Shyama Prasad Mukherjee and many other statesmen. “I want to tell all the BJP activists in Bengal that our governments in 19 states does not bear much significance unless we win in Bengal, the land of Syama Prasad Mookerjee, Swami Vivekananda and Rabindranath Tagore. “Our chariot of victory should not be stopped until we emerge victorious in Bengal,” he said. He also claimed there has been a total lapse of the law and order situation in the state under the current regime. “The law and order situation in the state is in shambles. Bengal is filled with the sound of bombs and bullets. Everyday we get to hear about the unearthing of illegal bomb factories, gun factories.